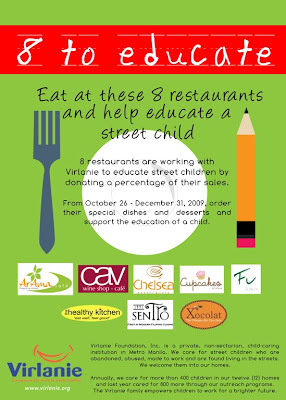 8 to Educate is an awareness campaign by 8 restaurants in Serendra and Bonifacio High Street and Virlanie Foundation, Inc. to promote and support education for disadvantaged children. The campaign run from October 26 to December 31, 2009. The participating restaurants have committed to supporting the campaign and donating a certain percentage of their sales each time a featured menu item is ordered. All are located at Serendra Piazza at Bonifacio Global City, Taguig. (632) 901-5817, (632) 909-7011 or (632) 909-7012. Sentro 1771 – Fried Chicken Cutlets, Catfish Adobo Flakes. Tel #: (632) 631-7339. Public schools – last year (2009), 441 of Virlanie’s children are enrolled in schools. 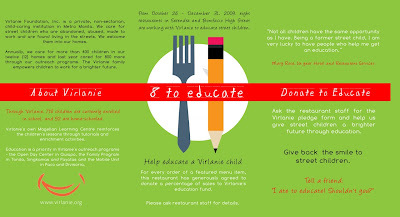 Home / School collaboration – 52 Virlanie children who cannot yet cope with public school are tutored in the homes and prepared for integration into public school. Preschool – currently 10 3-4 years olds attend preschool at Virlanie’s Magellan Learning Center. Curricular support (reading programs, computer skills, tutorials) is made available in Virlanie’s Magellan Learning Center. 112 children are enrolled. Special Education for Virlanie’s differently-able children is conducted by SPED teachers in the foundation’s Jade and Aime homes. In 2009, three teachers work with 47 children in the two homes. Some children also attend SPED schools outside Virlanie. Mobile education - for 150 street children (weekly average) in Paco and Divisoria through Virlanie’s Mobile Unit. Multi-level education for street children in Quiapo through Virlanie’s Open Day Center. 40 children are taught by two teachers. Sponsorship of the educational needs of close to 220 impoverished children living with their families in the province, and in Tondo, Manila, in Payatas, Q.C. and Brgy. Singkamas, Makati. Just for P800 per month, a sponsor can support the educational needs of an elementary student, paying for uniform, shoes, school supplies, transportation, meals and special projects. The amount varies for high school and college. Sponsors may correspond with ‘their’ child and will receive regular updates on his/her progress.